TOPEKA — It was the depths of the Great Depression — but the Hispanic community here still had something to celebrate. In 1933, Our Lady of Guadalupe Parish in Topeka, in what would become an annual tradition, held its first Fiesta Mexicana, a celebration of Mexican culture. And it crowned its first queen, 28-year-old Marie Mendoza, only six years later. Now, 85 years after its inception, the annual event will kick off on July 7 with a parade in downtown Topeka, and then continue from July 10-14 with Mexican food and culture, music and dancing. The fiesta is open to the public and has become one of the largest community celebrations of Mexican culture in the nation. For a few Catholic Topekans, however, the crowing of that first queen is more than history — it’s family history. At age 87, Juanita “Jennie” Barron still remembers hearing the news of her aunt’s royalty status as a young child. “I was 9 years old, and I remember when I heard she was elected queen,” said Barron. Her parents were particularly thrilled to learn that the many hours spent by the entire family selling tickets to family, friends and neighbors had paid off. Unlike most royalty contests, the title of fiesta queen is not based on popularity, but on the amount of fundraising done by the candidate. In Marie Mendoza’s case, her brothers had helped sell tickets. “It took a lot of money and effort,” said Billy Terry, one of Mendoza’s nephews. 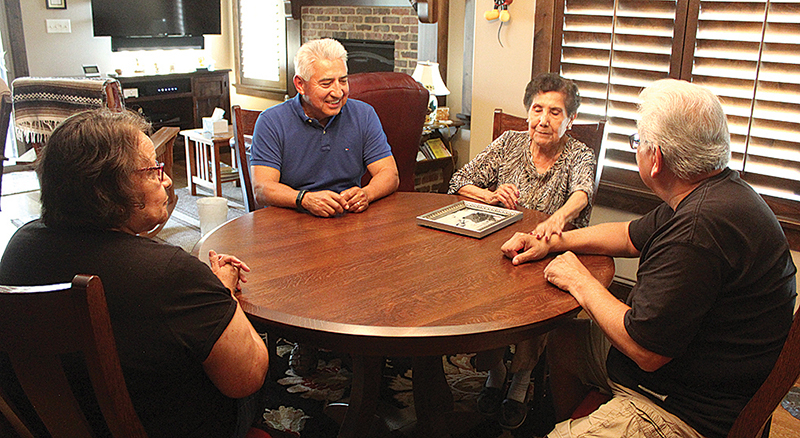 Recently, members of the Mendoza family gathered at the home of Faustino and Rita Mendoza — some in person and some via technology — to reminisce about what the fiesta has meant to their family. Faustino is also one of the nephews of Marie Mendoza. Although it took a lot of money and effort, according to those gathered, Marie took all the work in stride, recognizing and thanking everyone for their generosity and support. According to Rita Granado, Marie’s daughter, her mother was loyal to her parish and her community, but especially to her faith. It was her faith that propelled Marie, Granado said, to encourage and inspire others within the parish, community and her own family to give back. “Her commitment to the church was so important to her,” said Granado. “She remained very religious her whole life and would want people to support the endeavors of the church through raising funds every year. When she was crowned, said Terry, no one in the family expected the royalty contest to become an annual part of the fiesta. But the contest, like the fiesta, has now turned into a tradition nearly 80 years old, one in which numerous families have established two and three generations of fiesta royalty. In fact, Barron’s sisters became a queen and princess at later fiestas, and, like her great-aunt, Barron’s daughter also became a princess. Although Marie Mendoza eventually moved away from Topeka, Faustino Mendoza remembers Granado and his aunt returning to Topeka to participate in the 75th anniversary of the fiesta, one in which former royalty were honored at the coronation ball for their legacy and commitment to the parish. For more information about Fiesta Mexicana, including a complete schedule of events, visit the website here.